Kim Socha, who holds a PhD in English Literature and Criticism, is an English professor working in the US. A grassroots animal liberation advocate, Kim is also active in drug policy reform, and transformative justice. Kim is the author or editor of 4 books relating to animal rights and veganism including her most recent from 2014, Animal Liberation and Atheism: Dismantling the Procrustean Bed. 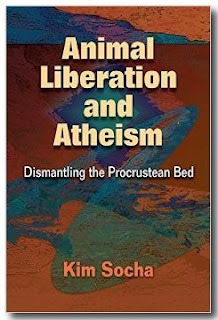 Prof. Socha joined us to speak about that book, in which she makes the case that adherence to any of the world's major religions is antithetical to an animal liberation perspective and practice. Audio podcast, approx. 52 minutes. It is perfect time to make some plans for the future and it is time to be happy. I’ve read this post and if I could I desire to suggest you few interesting things or tips.